News - Intel Adds Mobile Core i3-8130U to Lineup: Increased Cache and Turbo | Softoolstore - Самые интересные новости, обзоры технологий и софта. Intel on Tuesday introduced the Core i3-8130U, its first mobile 8th Generation Core i3 processor. The new chip features two cores operating at a high frequency and supports Turbo Boost 2.0 technology to make them even faster when power and temperatures permit. The CPU also gains an L3 cache size increase over its predecessors, stepping up to 2MB of inclusive L3 cache per core. 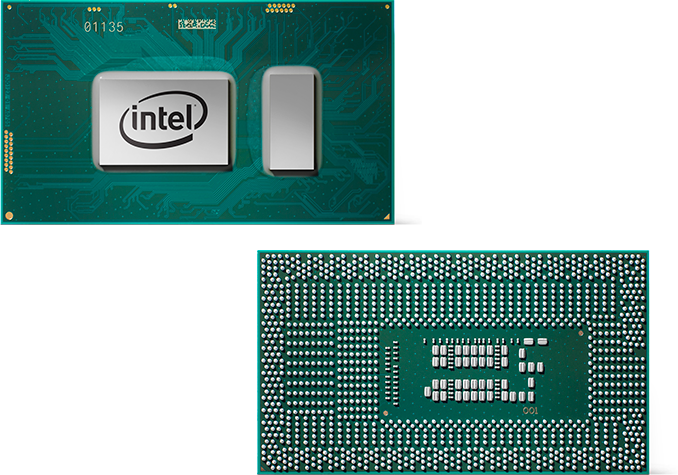 However, the new processor is listed as only $16 cheaper than one above it in Intel's stack, the quad-core Core i5-8250U, posing questions about its appeal to the end-user. The Intel Core i3-8130U has two cores with Hyper-Threading, operating at 2.2 GHz base frequency and speeding up to 3.4 GHz in Turbo Boost 2.0 mode; the chip is outfitted with 4 MB of L3 cache and has a 15 W TDP. Previous-generation mobile ULV Core i3 processors came with 3 MB of L3 cache and did not feature Turbo mode, by comparison. The addition of Turbo comes at a different cost, as it would appear that Intel has reduced the base frequency to compensate: the default frequency of the previous generation Core i3-7130U was 2.7 GHz, whereas the new Core i3-8130 is at 2.2 GHz. There is also the added complication that Turbo frequency boosting depends on multiple factors, such as chassis design and cooling performance. When it comes to graphics and memory, the new CPU features the UHD Graphics 620 iGPU (GT2) as well as a dual-channel memory controller supporting LPDDR3-2133 or DDR4-2400. From silicon point of view, we are dealing with a Kaby Lake Refresh 2+2 design, and the main difference with the original Kaby Lake is the addition of native support of HDMI 2.0, HDCP 2.2, and possible minor fixes. Intel positions the Core i3-8130U as its lowest-cost offering for the latest mainstream notebooks and 2-in-1 PCs. The processor is listed at $281 in 1000-unit quantities, which is only $16 cheaper than the price of the quad-core Core i5-8250U. Historically, RCPs of Intel’s higher-end mobile Core i3 products have matched (or almost matched) prices of the company’s entry mobile Core i5 offerings, so there is nothing new here. However, the difference between 7th Generation mobile Core i3 and Core i5 was negligible and pricing of these CPUs just reflected that. By contrast, today we are dealing with a $297 quad-core Core i5-8250U operating at 1.6-3.4 GHz as well as a $281 dual-core Core i3-8130U operating at 2.2-3.4 GHz. Despite the clock speed difference, we would expect many modern workloads that are multi-threaded to give the i5-8250U a significant advantage over the i3-8130U. In any case, at $281, the new CPU is currently the most affordable 8th Generation mobile Core processor and it will enable PC makers to build slightly cheaper versions of their latest laptops or 2-in-1s. Note: The image above depicts Intel’s 8th Generation Core i7 SoC. The 8th Generation Core i3 SoC may look differently. Intel 8th Generation and 9th Generation Processor Lists Leaked: Coffee Lake Refresh?